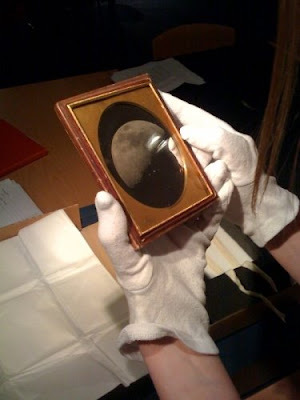 Back in Bradford after travelling around the world on loan, this 150-year-old daguerreotype of the Moon is just one of our collection’s hidden treasures. A trip downstairs to see Brian Liddy, our Curator of Collections Access, is always rewarding. His job is to look after our shelf upon shelf and room upon room of object collections—and every time you step through his office door, he’ll show you something amazing he’s working on. 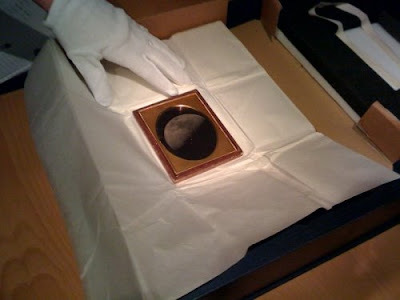 Yesterday, it was a 150-year-old photograph of the Moon. This shot of our satellite is a daguerreotype—the daguerreotype process being the world’s first practical method for creating permanent photographs, invented by Louis Daguerre in the 1830s. This photo was taken in 1851 by John Adams Whipple (1822–1891) and George Phillips Bond (1825–1865). Whipple won prizes for his astronomical photography—he was the first to take pictures of stars other than our sun. Bond was the director of Harvard College Observatory, who worked with Whipple to advance the quality of photography of the heavens. Brian was checking the object after it had come back from a loan to the San Francisco Museum of Modern Art and the Albertina in Vienna—at every stage during an object’s journey around the world, it’s checked and double-checked to ensure it remains in pristine condition. The daguerreotype has since been returned to its original location in the museum stores, inside Insight: Collections & Research Centre. This daguerreotype is particularly precious as we’ve had it in our collection for over 50 years. It was first acquired by the Science Museum in 1943.